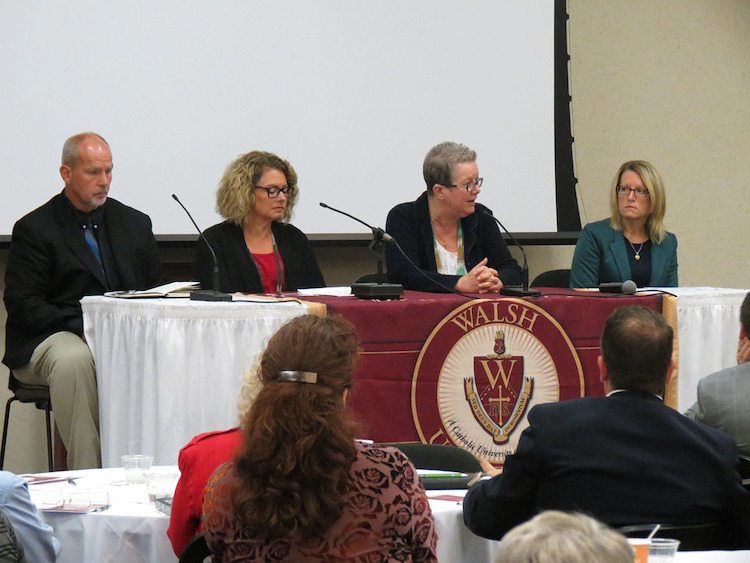 More than 220 health care and law professionals came together on September 25 at Walsh University for the community symposium, Mental Health & Addiction: Breaking the Stigma. The event was held in collaboration with Walsh’s James B. Renacci Center for Civic Engagement, the Gary and Linda Byers Institute for Community Health, the Stark County Mental Health & Addiction Recovery and the Akron Bar Association. The symposium explored the current state of behavioral health and addiction issues in our local community and region. The conversations during the day brought together thought leaders from across the area, and country, to discuss the response to the current crisis, including ways to address the addiction, mental health and psychiatric needs of the community. During his opening remarks, Walsh President Richard Jusseaume took a moment to thank those in attendance for heading their professional call to work compassionately with those living with issues of addiction and mental health in our own community. The Morning Panel Discussion moderated by Judge Sara Lioi and included former Walsh student Judge Richard Loftus (RET. ), San Jose, California; Judge Elinore Marsh Stormer, Summit County Probate Court; and Judge Curt Werren, Canton Municipal Court. Executive Director of StarkMHAR John Aller presented a Current Situational Assessment followed by a Mental Health and Our Community Panel with Julie Stone, Byers School of Nursing; Dr. Ruthann Anderson, Program Director, Counseling and Human Development, Walsh University; and Keith Hochadel, CEO, CommQuest; moderated by Michele Boone, StarkMHAR. The Keynote Luncheon featured Dr. Nicole Labor, Medical Director of OneEighty in Wooster, OH. OneEighty is a treatment center that offers inpatient and outpatient chemical dependency and behavioral health services in Wooster, Ohio. Dr. Labor spends time educating healthcare professionals, churches, schools, and community members on the disease of addiction. Through her work, she focuses on removing the stigma surrounding addiction. Many of her lectures have been unofficially recorded and are available on social media. She also is the director of the addiction medicine Fellowship for Summa and the medical director for Interval Brotherhood Home in Akron, Ohio and the Esper Treatment Center in Erie, Pennsylvania.